Many obstacles exist that can interfere with a pilot’s ability to maintain situational awareness. For example, fatigue, stress, or work overload can cause the pilot to fixate on a single perceived important item rather than maintaining an overall awareness of the flight situation. A contributing factor in many accidents is a distraction, which diverts the pilot’s attention from monitoring the instruments or scanning outside the aircraft. Many flight deck distractions begin as a minor problem, such as a gauge that is not reading correctly, but result in accidents as the pilot diverts attention to the perceived problem and neglects to properly control the aircraft. Fatigue, discussed as an obstacle to learning, is also an obstacle to maintaining situational awareness. It is a threat to aviation safety because it impairs alertness and performance. [Figure 9-5] The term is used to describe a range of experiences from sleepy, or tired, to exhausted. Two major physiological phenomena create fatigue: sleep loss and circadian rhythm disruption. 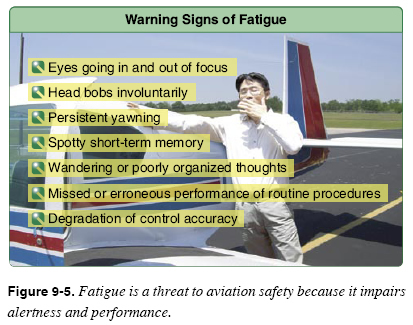 Fatigue is a normal response to many conditions common to flight operations because characteristics of the flight deck environment, such as low barometric pressure, humidity, noise, and vibration, make pilots susceptible to fatigue. The only effective treatment for fatigue is adequate sleep. As fatigue progresses, it is responsible for increased errors of omission, followed by errors of commission, and microsleeps, or involuntary sleep lapses lasting from a few seconds to a few minutes. For obvious reasons, errors caused by these short absences can have significant hazardous consequences in the aviation environment. Sleep-deprived pilots may not notice sleepiness or other fatigue symptoms during preflight and departure flight operations. Once underway and established on altitude and heading, sleepiness and other fatigue symptoms tend to manifest themselves. Extreme fatigue can cause uncontrolled and involuntary shutdown of the brain. Regardless of motivation, professionalism, or training, an individual who is extremely sleepy can lapse into sleep at any time, despite the potential consequences of inattention. 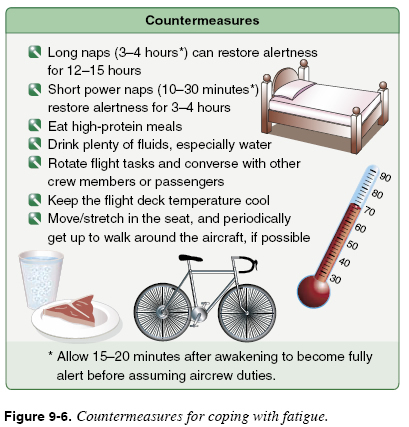 There are a number of countermeasures for coping with fatigue, as shown in Figure 9-6. Complacency presents another obstacle to maintaining situational awareness. Defined as overconfidence from repeated experience on a specific activity, complacency has been implicated as a contributing factor in numerous aviation accidents and incidents. Like fatigue, complacency reduces the pilot’s effectiveness in the flight deck. However, complacency is harder to recognize than fatigue, since everything is perceived to be progressing smoothly. Highly reliable automation has been shown to induce overconfidence and complacency. This can result in a pilot following the instructions of the automation even when common sense suggests otherwise. If the pilot assumes the autopilot is doing its job, he or she does not crosscheck the instruments or the aircraft’s position frequently. If the autopilot fails, the pilot may not be mentally prepared to fly the aircraft manually. Instructors should be especially alert to complacency in students with significant flight experience. For example, a pilot receiving a flight review in a familiar aircraft may be prone to complacency. Advanced avionics have created a high degree of redundancy and dependability in modern aircraft systems, which can promote complacency and inattention. During flight training, the CFI should emphasize that routine flight operations may lead to a sense of complacency, which can threaten flight safety by reducing situational awareness. By asking about positions of other aircraft in the traffic pattern, engine instrument indications, and the aircraft’s location in relation to references on a chart, the instructor can determine if the student is maintaining situational awareness. The instructor can also attempt to focus the student’s attention on an imaginary problem with the communication or navigation equipment. The instructor should point out that situational awareness is not being maintained if the student diverts too much attention away from other tasks, such as controlling the aircraft or scanning for traffic. These are simple exercises that can be done throughout flight training, which help emphasize the importance of maintaining situational awareness.